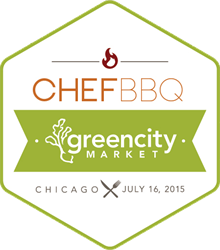 Green City Market's Chef BBQ is MY favorite summertime event in Chicago. I have been attending the Chef BBQ for years now, and I always have the BEST time. I am an avid supporter of Green City Market, as I love buying local, and having the comfort of knowing my farmers and where the food that I ultimately consume, comes from. Furthermore, the GCM BBQ includes participation from a bunch of Chicago's top chefs and restaurants, so it fits right up my alley by combing my favorite interests. GCM Chef BBQ really does offer the best of the best, featuring celebrity chefs like Rick Bayless and Stephanie Izard, among others... So buy a ticket and have a chance to mingle with them! 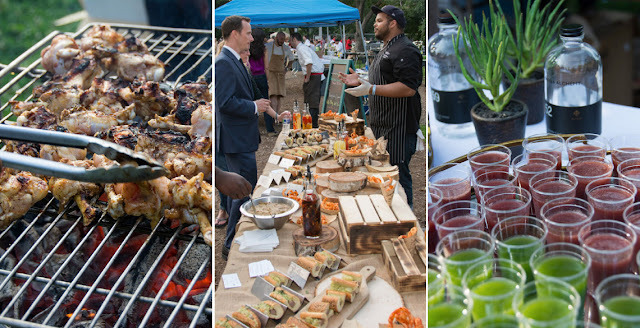 On Thursday, over 100 of Chicago's top restaurants provide tasting portions of local, sustainable, heirloom produce and heritage meats sourced from GCM farmers. Multiple Midwest brewers, distilleries, and wineries offer tastings of their handcrafted beverages with a focus on locally sourced ingredients. The VIP experience includes: one hour early admission to the BBQ, access to the VIP Lounge, open bar, and passed hors d'oeuvres from Limelight Catering. • A small cabana to accommodate 10 guests. • Dedicated server for food and beverage service. •Reserved tables of 2, 4, 6, 10, and more available for purchase at the per person price of VIP tickets. Need Chef BBQ transportation? Download the Curb Taxi app and enter promo code GREENCITY for $10 off your first ride! For each ride taken, Curb will donate $5 to Green City Market. The abundance of short coifs on women of a certain age is especially pronounced in Washington and in politics, where there are fewer creative iconoclasts, rule breakers and eccentrics who simply don't care what others think. For years, Clinton had a softly layered style one with volume on top that flowed gently inward to the nape of the neck. It was a look she settled on after years of dealing with the public's obsession with her headbands, her bangs, her bob. The cruelest thing, really, was that before more Starks met an untimely end and the Stark war effort beard shirt was seemingly quashed the episode brought the long suffering Stark family closer together than since Ned Stark made a huge mistake and went to King Landing. Arya came feyonce shirt within steps of her brother and mother corpses; Bran was literally a shout away from Jon Snow, the half brother he was on the family t shirts road seeking. Yet by episode end, Arya was bereft and the Hound prisoner, and Bran sent Rickon away while he went off on his quest.